My friends and I rented a run-down, drafty house during our last two years of college. The kitchen was far from perfect. It had dingy linoleum floors covered with a film of salt and mud from our snowy boots and mysterious sticky patches from the last party. Fat carpenter ant carcasses dotted the faded countertops because B, one of my more courageous roommates, was in the habit of smooshing them with her thumb but not in the habit of disposing of the bodies. Thinking about whatever might have lurked in the dank darkness of the cupboards gives me the shivers even now. But, despite all of that, the four of us roommates were into good food and we were always excited to take up a cooking project together. I can remember one afternoon when Brinda, the roommate who loved tap dancing and politics, wanted to bake us some chocolate chip cookies. Simple enough, right? I kept her company while she mixed up the dough, portioned it on the baking sheets, and popped it in the oven. There is nothing like the smell of freshly baked chocolate chip cookies to get a bunch of food-loving, sleepy, underfed, overstimulated college friends riled up. When she pulled the sheet out of the oven, all the dough had joined and slumped to one side of the pan. The cookie lump was melty, greasy, and strange. Poor Brindee was disheartened. She had no idea what had gone wrong. But instead of feeling blue, we decided not to apologize for our mysterious mistakes. We came up with an alternate solution. We told our roommates that we had never intended to make chocolate chip cookies. Instead we baked something tasty we called Nicaraguan sweet pile. Mmm. Much more appetizing, right? I’m not sure how we came up with that. That’s what happens when a politics major and a Latin American studies major put their heads together on recipe rebranding. Apologies to Nicaragua. I suppose we could have used a little PR help. But I can remember sitting on the kitchen counter with Brinda, the hot tray between us, forks in hands, and munching on Nicaraguan sweet pile. We were laughing our faces off and feeling pretty pleased. No regrets. Just joy. That’s what cooking should be. Here is my mom-in-law Deborah’s recipe for gluten-free oatmeal chocolate chunk cookies. They’re fantastic. Amazingly crisp, perfectly sweet, oaty joy. I doubt you’ll have any trouble baking these guys up, but should you run into problems, make no excuses. Just eat. 1. In a small bowl, combine gluten-free flour, baking soda, cinnamon, baking powder, and salt. In a large bowl, using a wooden spoon, combine brown sugar, granulated sugar, and butter. Stir in eggs, one at a time. Stir in vanilla. 2. Add flour mixture to butter mixture and stir to combine. Add oats, chocolate, raisins, and nuts. Set the dough aside for about 30 minutes. No need to refrigerate unless you’re planning on baking these guys tomorrow. Preheat oven to 375°. 3. 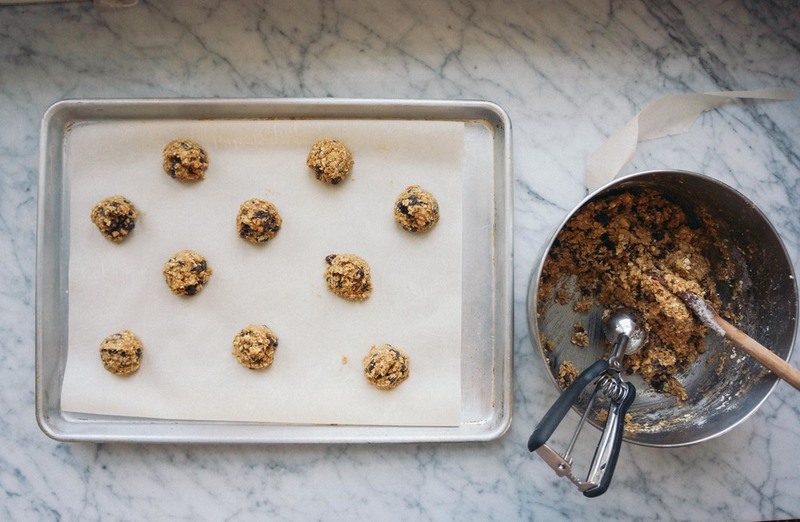 Drop dough by 1 1/2-tablespoon scoopfuls onto a parchment-lined cookie sheet. Flatten each cookie slightly. Bake until cookies are set and the edges are golden brown, about 10 to 12 minutes. Let cool on sheet for 2 minutes and then transfer to a rack to cool completely.